Recovering in a New York hospital after routine surgery, Lucy Barton wakes to find her mother by her bedside. For most people, a visit from a parent when they are ill isn’t unusual, but for Lucy, her mother’s visit is a shock. She hasn’t had any contact with her mother for many years. Over the five days of her mother’s visit to New York, the pair talk about people from Lucy’s hometown of Amgash, Illinois, and about Lucy’s childhood. It soon becomes clear Lucy’s childhood was one of poverty and abuse and her family dysfunctional. What begins as a reluctant conversation between mother and daughter develops into a more comfortable one, revealing longing and revelations. The story shifts from the past to the present and back again, painting a picture of Lucy’s past and of her current life –marriage, two children and desire to become a writer. 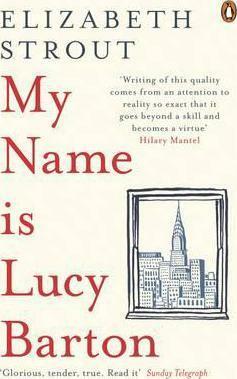 My Name is Lucy Barton is a beautifully written story which explores human relationships. Strout writes with compassion and tenderness about the complexity of family life, and how families influence decisions we make and the lives we live. Don’t be deceived – My Name is Lucy Barton may be a short novel, but it packs a punch and leaves the reader with much to think about.